File photo of a Red Wings Tupolev 204. 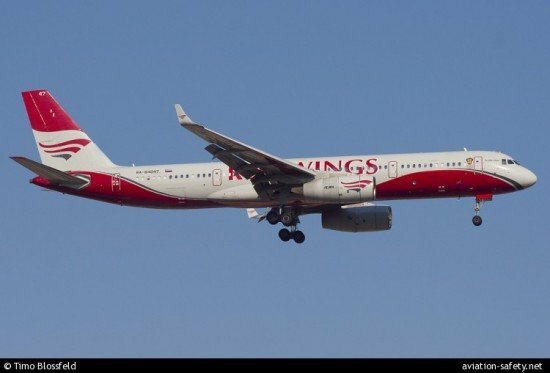 The Russian Federal Air Transport Agency, Rosaviatsiya, has decided to suspend the air operator certificate of Red Wings Airlines from February 4, 2013 over safety issues. In a statement, Rosaviatsiya reported that this decision was not associated with the causes of the Tu-204 of Red Wings that suffered a fatal accident on December 29, 2012. In the period from 10 to 16 January 2013 Rosaviatsiya held an unscheduled inspection of the operational and maintenance activities of the airline. This resulted in numerous significant violations in the organization of flight operations, aircraft maintenance, pilot training and other shortcomings. All of a systemic nature. In 2012, the Federal Air Transport Agency had also conducted two scheduled inspections, which resulted in shortcomings. No measures were taken to address those issues. Rosaviatsia also notes that at present Red Wings lacks the financial resources to provide ongoing operations while maintaining a high level of safety.